Here are the Top Irish Games to Play this Paddy's Weekend! Home News Here are the Top Irish Games to Play this Paddy’s Weekend! Here are the Top Irish Games to Play this Paddy’s Weekend! It’s Paddy’s Day once again, (or St. Patrick’s Day, NOT St. Patty’s Day!!) and in the typical Irish tradition the pubs are full, the streets closed off for the parades and us true gamers are shut indoors talking about how great our day is going. In the grand spirit of things I thought I would share some of the top Irish games currently available. The first game on the list and easily the most infuriating is Mr Grayscale! The game looks like a standard 2d platformer where you reach the end of the level while avoiding obstacles. While this is the case, it’s quite a bit more complicated than that. The player has many different ways to reach the goal, whats special about Mr Grayscale, however, is that the player can shift between white and black colour spaces. This means that the player can shift between walls to reach the end goal. Another feature of the game is the ability to rotate the different levels. At the start, this rotates the entire scene. However, as you progress, when you rotate the level other objects will remain static. This adds a whole new challenge entirely. I’ve played the game on a few different occasions and each time the multiple deaths and failures whisper to an anger that has been dormant since I stopped trying to beat Super Meat Boy. Mr Grayscale is still in development and will be coming to Xbox One, PS4, PC, Mac and Linux sometime this year. If you want to stay up to date on the development you can follow along on the website, Facebook or Twitter. Deep from Owen Harris is one of those games that you could watch someone play for hours. It’s been at most Irish gaming and tech events over the last few years and because it’s VR, it takes up enough room to be immediately noticeable. Players move throughout the vast underwater world of ‘Deep’ by literally ‘breathing deep’. The custom-made controller measures diaphragm expansion and translates this to movements in the game. The idea is to make players more aware of their breathing. As someone who suffers from anxiety and regularly has panic attacks, the concept of Deep fascinates me. Deep is currently in development but the demo can be played at may upcoming Irish events. You can get more information about the game over on the Deep website. Be sure to follow the developer, Owen Harris on Twitter and check out his personal website to see more of his work. 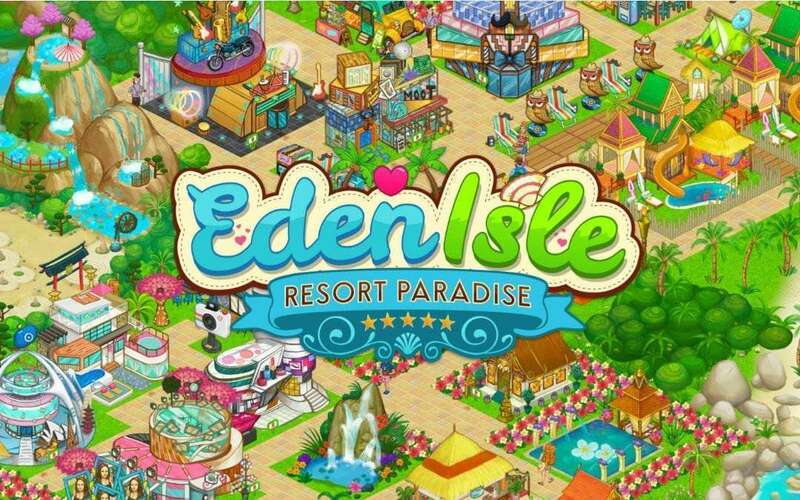 Eden Isle: Resort Paradise from Simteractive is one of the games I got to try out at the Galway Games Gathering last year. It’s a city builder type game where you have to design the perfect resort. You have different types of campers such as Hippies, Hipsters and Glampers, each one comes with specific activity preferences and requirements. As you progress you unlock more buildings and locations. The game itself is free with optional in-game purchases to expand the resort faster. The game is currently iOS only (sorry Android users!) and you can pick it up here. The game is regularly updated with new content and bug fixes and the dev team behind the game rely heavily on player feedback. After Life – Story of a Father is literally about the story of a Father experiencing the ‘afterlife’, of a sort. You play as Rick Dennehy, who passed away in the 90s and returns as a glowing orb thing. As you go around to your family members you hear about your life as they remember it. You also get to find out how the family members dealt with the passing of Rick. The game is set in Ireland and all the voice acting is done by native speakers. The soundtrack was composed by Neal Bond, who is an Irish composer. The game is available now on Steam with the option to also purchase the soundtrack as a DLC. Danger Mouse – The Danger Games is a frustratingly fantastic and enjoyable endless runner game. I first saw this game at Gamescom where 9th impact was set up in a massive area. You might think, “Well, why would they need such a large space for a couple of mobile devices?”. They didn’t! The extra space was for the obnoxiously large Danger Car! My first three questions that were answered rather quickly was “Yes, it is a real car”, “Yes it runs” and “Yes, it can be legally driven in the UK and Ireland”. Alas, the answer to my fourth question was “No, you can not take it for a shpin with the lads”. The game itself is an endless runner, where you play as Danger Mouse (or a host of other characters from the series) and the goal is to reach the finish line first. Much like Mario Kart, you have a plethora of obstacles and power-ups to get you on your way. The feature I liked most is that you can race against real players around the world. The game is highly entertaining and very addictive, which is kinda why it won our “Most Innovative Game” award at Gamescom. Seriously, why aren’t you downloading this already? Oh wait, I never gave you the link yet, here you go, Android and iOS. Now get playing, it’s free! Cerebros is a hybrid between a First-Person Shooter and Puzzle game. There are two colour states, red and blue, and you have to change between the two defeat the AI attackers. For example, in the blue colour state you can shoot all things red, so red AI and environment blocks. The real challenge is when you are surrounded by both colour states and you have to carefully switch between the two to survive. The game is currently in development and there is currently no confirmed release date. To stay up to date on the game and its goings-on be sure to check out the website and follow along on their Twitter. The Little Acre from Pewter Games Studios is a short and fun game that pays tribute to a lot of overlooked Irish quirks. It’s a hand-drawn, point & click adventure where you play as Lily, who can’t seem to avoid finding trouble. Both Lily and her father Aiden get transported into another dimension by one of her grandfathers (his fathers) inventions. The creatures they find in that dimension feed on the ‘life essence’ of the things around them and as a result, they take on the characteristics of them. The voice acting of the game is terrific and the story is both engaging and full of humour. It’s a great game for all ages, kids will instantly love it and older people (myself) will understand a lot of the (very) Irish references. It’s available now on PC, Xbox One, and PS4. Right now the iOS version of the game is discounted to €1.99 until March 25th (see tweet below). The Little Acre on iOS, from Dublin's own @Pewter_Games, is discounted to £1.99 for a limited time only until the 25th of March. When I first saw Guild of Dungeoneering in its development phase at one of the DubLUDO events I was pretty amazed. Gambrinos new and exciting take on the typical dungeon crawler was refreshing, to say the least. Instead of moving a character through a pre-designed dungeon, you instead create the dungeon around the character. Confused yet? While playing, you get different cards, each with different shapes of hallways bu which you lead the mighty hero. The idea is to lead him around so that he can get as much loot and weapons as is needed before confronting the boss. Keep in mind, you don’t control the character in the traditional sense, you must manipulate his decisions. Along with hallway cards, you also get loot. for example, if you want the hero to turn right at a dividing hallway as opposed to left, you can place a bag of gold on the tile you want him to end up. As you progress through the game you unlock more cards and different heroes. Each hero has a unique set of skills and will react differently to obstacles in the dungeons. One of my favourite parts of the game, (okay, it makes me rage quit from time to time), is the bard. When you die, (it’s gonna happen a lot, I promise! ), a little bard comes out and sings a song of slander and rhyme. Basically, he rips the absolute piss out of you for getting killed! While this is a fun little feature, it can test one patience when you’ve died 18 times in a row (yes I’m serious) and the reason you played the game was to relax before flying to Gamescom at 4 am the next day. Guild of Dungeoneering is currently available on Steam, iOS and Android. The Darkside Detective is a 2d pixel art point & click adventure/mystery game. The art style is fantastic, the storyline is superb and the eerie music is exceptionally done. The Darkside Detective happens to be Detective Mcqueen. The premise of the game is that there are weird happenings going on and it’s his job to investigate. The other guy is Officer Dooley, a beat cop who makes jokes that nobody understands. Their relationship is somewhat similar to myself and our reviews editor Vinny, he’s always making bad jokes and all I want is a good cup of coffee! Detective Mcqueen is also regularly referred to as a hobo. The game comes from Galway based games studio Spooky Doorway, made up a team of amazing developers. Paul Conway does all the art for the game, he also makes terrible jokes that (thankfully) never made it into the game. The storyline is thanks to Dave McCabe, an elegant fellow with a majestic long-flowing beard. Tracey McCabe handles all the backend code-writing magic and that perfectly dramatic soundtrack is thanks to Ben Prunty. The game offers a lot of content and because you can approach each level a few different ways there’s a good bit of replayability. If you would like to know our thoughts on the game you can check out our full review. If you want to pick up the game, the Steam version is currently on sale for the St. Patricks Day period. You can also get it for the Nintendo Switch.